Himalayan dog chews are now one of my dog’s favorite chews, but you would’ve never thought it considering she barely touched her first one! Since discovering what bully sticks are actually made of and reading scary warnings about rawhide chews, I’ve been increasingly relying on sweet potato chews, these Himalayan dog chews, and single-protein dog treats. Over the years, we’ve tried out many different brands so I wanted to share my knowledge in this Himalayan dog chew review so more people will consider trying out this cheesy dog chew. Disclosure: This post may contain affiliate links. If you click on one of my affiliate links and make a purchase, I may receive a commission for referring you. What is a Himalayan Dog Chew? A Himalayan dog chew is a hardened cheese snack made in the tradition of the Nepalese. When I say hard, I mean that I’m unable to break it apart with my hands. I’m sure if I slammed it across concrete, it would shatter, but it’s definitely a durable snack worthy of the toughest chewers. Generally, Himalayan dog chews are made out of yak or cow milk, with minimal amounts of salt and lime juice. If you’re curious about how to make it on your own, check out this Himalayan dog chew DIY instruction. Yak milk will produce a harder cheese. Cow milk will produce a softer cheese. Note, you probably won’t be able to make it at home yourself. 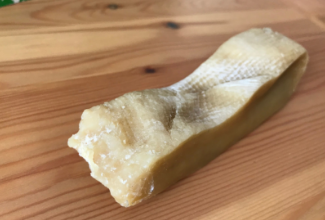 The idea behind the Himalayan dog chew is that your dog really needs to soften it up with her saliva before being able to chew parts of it off. My dog is occasionally able to chip off pieces directly from chewing it, which emits a loud crunching noise. This worries me a bit because perhaps the chew is too hard for her teeth, but I haven’t yet noticed any damage, so I’m okay so far. However, if it happens with your dog frequently, I’d ask your vet to make sure it’s okay. You can let your dog chew off the cheese completely until it’s the size where it’s small enough to become a choking hazard. Definitely take it away, then. Good news, though – your dog can still finish the end pieces simply by popping it in the microwave. When the Himalayan dog chew gets to the end pieces, you can pop it onto your microwave. I do it for around 1-2 minutes (I have a weak microwave). You’ll know it’s ready when it puffs up, doubles in size, and stops expanding. Once cooled down, you can give it back to your dog for an easy-chewing treat. Himalayan Dog Chew is the original company for yak cheese dog chews. They are committed to sourcing their products fairly and in keeping with the traditions of the Nepalese culture. They originally partnered with small Nepalese farmers but have since been partnering with a third generation family farm in Washington state. They offer five different sizes based on the maximum weight of your dog. Native Pet is my choice for organic Himalayan yak chews. EcoKind Pet Treats is your go-to if you’re looking to buy a lot of yak chews at the same time. Perhaps you’re having a doggie party, or you’re donating to a pet shelter. Or maybe your dogs really like these chews, and you’re stocking up. Regardless of the reason, you can choose between a 1lb, 3lb, and 5lb bag. My dog, Clover, is now a big fan of Himalayan dog chews. The first cheese chew I ever got her was probably a few years back after I watched the founders of Himalayan Dog Chew pitch their company on Shark Tank. Back then, I still regularly gave her bully sticks, pig ears, and random (super smelly) animal chews, so she always had her choice (we definitely spoiled her). She was quite the picky eater, and so when we ordered our first one and she barely touched it, we assumed it was just not for her. Since cutting out bully sticks a year ago, her only chews have been sweet potatoes and dental chews. In the spur of the moment, we also decided to try Himalayan cheese chews again. What do you know, she loved it! I definitely think she prefers ‘bully sticks’ (more… meaty) over these cheese sticks; however, in the absence of bully sticks, she eats these Himalayan yak dog chews happily. A less picky dog would like this (and everything else you give him). I don’t think my dog will be following a vegetarian or vegan diet, but I think it’s nice to cut down on her meat consumption. She gets a bit more than half a pound of meat-based foods every day. Given that animal agriculture has an immense (negative) toll on the environment, I figured that any extracurricular chews (non-essential foods) can be mostly vegetarian. That’s how I ended up trying the Himalayan yak dog chews again. I don’t give my dog cooked bones because I’ve been warned about bones splintering and puncturing internal organs. However, it never occurred to me that I should be worried about hardened cheese doing the same. As I was drafting this post, I wanted to consider some other customer perspectives since my own experiences represent a single data point. I read through hundreds of Amazon reviews, and some were down-right scary. Surgery stores, photos of shattered chews with pointy edges, and quality concerns. I started wondering if even I should reconsider giving these to my dog. It only takes one bad instance to change a dog’s life. From my experience, this is what a normal gnawing will look like. No sharp edges and no splintering or cracking. Ultimately, it’s up to you to weigh the benefits and risks. In a perfect world, I would forbid my dog from chewing on branches (which she loves) because it similarly might puncture her organs. In an optimal world, I would muzzle my dog to stop her from munch on the chicken wing bones that she finds discarded on the streets every week. In an ideal world, I’d be able to monitor my dog while she’s enjoying any dog chew (as advised on nearly every chew), but that’s just not realistic. There are risks in a lot of things in the world, but it’s up to you to decide how sheltered you want your dog’s world to be. I’ve personally chosen to keep purchasing Himalayan dog chews for Clover, but if I get a batch that is prone to splintering, I’ll microwave puff those up immediately for my dog to eat instead of chew. If the chew is being consumed as expected (i.e., slowly getting smaller by constant gnawing), I’ll be okay with leaving her unattended with that chew. I hope this Himalayan dog chew review gives you more of an understanding of these vegetarian dog snacks. Will you be trying them out? I have given my dogs these Himalayan chews and I also have mixed reviews. My girl is a 20 lbs Bichon and she chews through EVERYTHING. I’ve had heavy duty toys made specifically for heavy chewers ripped to shreds (this includes rubber) within minutes of her getting it. The first attempt with these chews was through a dog training school when she was 10 months old. It worked out well. I did got one from Natural Dog Company last year and it drew blood from her mouth. My other dog eats them as he should and there’s no problems. I think it really depends on the brand AND the dog. That’s good to know. Do you have a particular brand that you prefer now?